From the Department of Family Medicine, University of Illinois College of Medicine, Chicago (JH); the Centers for Disease Control and Prevention, Atlanta, GA (PJT, AMP, JRT); the Altarum Institute, Ann Arbor, MI (TW, MS, JL, CCD); Paul Epner LLC, Evanston, IL (PE); and the Department of Pathology, University of Utah, Salt Lake City (BRJ); and ARUP Laboratories, Salt Lake City, UT (BRJ). Background: The number and complexity of clinical laboratory tests is rapidly expanding, presenting primary care physicians with challenges in accurately, efficiently, and safely ordering and interpreting diagnostic tests. The objective of this study was to identify challenges primary care physicians face related to diagnostic laboratory testing and solutions they believe are helpful and available to them. Methods: In this study, sponsored by the Centers for Disease Control and Prevention, a random sample of general internal medicine and family medicine physicians from the American Medical Association Masterfile were surveyed in 2011. Results: 1768 physicians (5.6%) responded to the survey. Physicians reported ordering diagnostic laboratory tests for an average of 31.4% of patient encounters per week. They reported uncertainty about ordering tests in 14.7% and uncertainty in interpreting results in 8.3% of these diagnostic encounters. The most common problematic challenges in ordering tests were related to the cost to patients and insurance coverage restrictions. Other challenges included different names for the same test, tests not available except as part of a test panel, and different tests included in panels with the same names. The most common problematic challenges in interpreting and using test results were not receiving the results and confusing report formats. Respondents endorsed a variety of information technology and decision support solutions to improve test selection and results interpretation, but these solutions were not widely available at the time of the survey. Physicians infrequently sought assistance or consultation from laboratory professionals but valued these consultations when they occurred. Conclusions: Primary care physicians routinely experience uncertainty and challenges in ordering and interpreting diagnostic laboratory tests. With more than 500 million primary care patient visits per year, the level of uncertainty reported in this study potentially affects 23 million patients per year and raises significant concerns about the safe and efficient use of laboratory testing resources. Improvement in information technology and clinical decision support systems and quick access to laboratory consultations may reduce physicians' uncertainty and mitigate these challenges. In 2012, the Centers for Disease Control and Prevention's Clinical Laboratory Integration into Healthcare Collaborative (CLIHC), with support from the Altarum Institute, completed a national survey of family medicine and general internal medicine physicians to explore their degree of uncertainty when ordering and interpreting clinical laboratory tests, the challenges they face with laboratory diagnostic testing, and solutions to improve test utilization. Also of interest was the frequency with which primary care physicians initiate communication with laboratory professionals and the helpfulness of these consultations. Survey questions were based on the results of 3 focus groups comprising 27 primary care physicians and on suggestions from a panel of experts in primary care and laboratory medicine. Nineteen questions with subparts were constructed for the survey. Survey respondents were asked to consider laboratory testing for diagnostic purposes only, not for routine screening or monitoring of chronic diseases. The survey was judged exempt from institutional review board review by the Office of the Associate Director for Science, Office of the Director, Centers for Disease Control and Prevention. The full text of the questionnaire is available upon request. A random sample of 31,689 family medicine and general internal medicine physicians was drawn from the 2011 American Medical Association (AMA) Masterfile. In December 2011, letters were mailed to these physicians inviting them to complete the online survey. Those who did not complete the survey after receiving the letter of invitation were subsequently E-mailed a link to the survey. Two additional E-mails were sent to nonresponders in January and February 2012. To encourage participation, respondents were invited to direct a $10 donation to their choice of 1 of 5 charities. Of the 31,689 physicians, 29.67% opened one of the E-mail invitations and 18.8% (n = 1,768) of those who opened an E-mailed invitation completed the survey, a 5.6% overall response rate. Demographic characteristics of the respondents (Table 1) are similar to the AMA Masterfile physician population and to the sampling frame. Physicians had an average of 80.9 patient visits per week and reported ordering diagnostic laboratory tests during an average of 31.4% of these patient encounters. They reported uncertainty about test ordering in 14.7% and uncertainty in interpreting results in 8.3% of these diagnostic encounters. Physicians reported using a variety of tactics to overcome uncertainty in ordering and interpreting laboratory tests, as summarized in Figures 1 and 2. As reported by physicians, the most helpful/useful tactics for overcoming these uncertainties about testing were curbside consultation, E-references, and referral to specialists. In addition, when physicians were uncertain about test interpretation, they frequently brought patients in for follow-up and a review of their medical histories. Only 6% of respondents consulted with laboratory professionals on a weekly basis, although they found that the consultation was useful. Overcoming uncertainty in ordering laboratory diagnostic tests. The percentages of primary care physicians reporting the helpfulness of these tactics as very helpful or extremely helpful and the percentages using these tactics daily or at least once a week are shown. PCP, primary care physician. Overcoming uncertainty in interpreting laboratory test results. The percentages of primary care physicians reporting the usefulness of these tactics as very useful or extremely useful and the percentages using these tactics daily or at least once a week are shown. PCP, primary care physician. 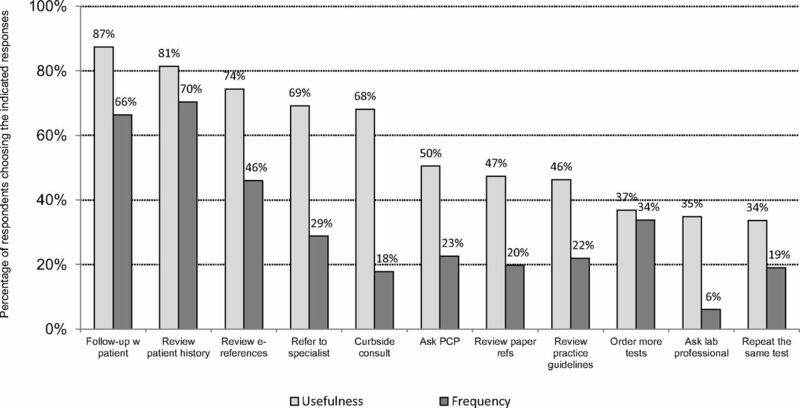 Physicians agreed that the following factors were important influences on their test ordering: national (63%) and local (46%) clinical practice guidelines, patient factors related to insurance (40%), patients' cost (53%), and malpractice concerns (39%). Physicians' challenges in test ordering are listed in Table 2. Two general categories emerged: (1) cost and insurance and (2) test ordering mechanisms. Cost to patients and insurance company rules were the most challenging. The mechanisms for ordering tests were less problematic yet still important challenges. Physicians' challenges with interpreting and using test results are summarized in Table 2 and comprised 2 general categories: receiving the results and report formats. Physicians' degree of endorsement of 11 possible solutions to improve test ordering and results interpretation is shown in Figure 3. Usefulness ranged from 46% for computerized physician order entry (CPOE) without electronic suggestions to 74% for reflex testing and trending of laboratory results over time. Almost 50% of respondents have CPOE without electronic suggestions but they rank it the lowest in usefulness. Availability of solutions ranged from 11% for CPOE with electronic suggestions for appropriate tests to 67% for interpretative comments. Only 11% of respondents had CPOE with electronic suggestions, but 60% of these physicians found it useful. Solutions for more effective use of diagnostic laboratory testing. The percentages of primary care physicians endorsing these solutions as very useful or extremely useful and the percentage with these solutions available at their site. CPOE, computerized physician order entry. We asked several questions about the helpfulness of consultation with the clinical laboratory. The percentage of respondents who reported contacting laboratory professionals at least once per week ranged from 4% for medical or scientific opinion of significance of results to 26% for status of missing results. The percentage reporting that these communications were very or extremely helpful ranged from 37% for assistance with appropriate test ordering based on patient's symptoms and history to 65% for technical assistance regarding sample collection or submission. From this national survey, we compiled a database of the challenges primary care physicians face in ordering and interpreting laboratory tests and physicians' suggestions for improving clinical laboratory utilization. Many respondents reported challenges in ordering and interpreting appropriate laboratory tests. These survey respondents reported some degree of uncertainty in ordering tests for 14.7% of patient encounters and interpreting test results for 8.3% encounters in which physicians ordered diagnostic laboratory tests. With more than 500 million patient visits to primary care physicians per year8 and 31.4%, or 157 million patient visits, resulting in test ordering, the levels of self-reported uncertainty in this study could affect ordering tests for 23 million patients and interpreting test results for 13 million patients per year. This level of uncertainty raises significant concerns about the safety and efficient use of laboratory testing resources. More than 50% of physicians reported that a variety of IT solutions would be very useful to them; however, these decision support technologies were not yet available to most of our respondents in December 2011. Of all respondents, 88% use CPOE at least weekly, but they did not find CPOE per se useful for guidance in test selection. CPOE that has embedded in the software suggestions or prompts about appropriate testing (ie, electronic clinical decision support) was judged to be very to extremely useful by 60% of the physicians, but only 11% had access to it. Mobile devices with clinical decision support applications are emerging as alternatives to those embedded in EMRs. We believe that EMRs and mobile applications are 2 platforms for clinical decision support that hold great promise for improving test selection and interpretation. Physicians frequently obtain curbside consults, consult E-references, and refer patients to specialists when uncertain about diagnostic issues. Consultation with pathologists and laboratory personnel could also be a rapid and cost-effective method for reducing uncertainty about test ordering and interpretation. Smith et al15 proposed this potential metric to improve primary care laboratory testing processes: “Primary care providers should have convenient access to laboratory physicians to assist in laboratory test ordering and interpretation.” Laboratory managers and pathologists should develop better communication channels with busy physicians to make consultative services easily available. This could improve patient care through more appropriate laboratory utilization and potentially reduce costs by avoiding specialist referrals solely for test interpretation. The low response rate in this survey (5.6%) and inclusion of only primary care physicians limits the generalizability of these results. The low response rate may have been due in part to the length of the survey. The web-based survey design may have deterred physicians who are less adept with technology. The respondents' demographic characteristics, however, are similar to those of the population included in the AMA Masterfile of family physicians and general internal medicine physicians and cover a wide range of ages, years in practice, and practice settings from physicians throughout the United States. Therefore, results may broadly represent the common experiences of primary care physicians. We solicited physicians' opinions; therefore, we cannot verify the extent to which objective evaluation would confirm our findings. Finally, prior research shows that physicians may be overconfident about their knowledge,16 which, when combined with social desirability bias, may have resulted in underreporting of uncertainty regarding test selection and results interpretation. Improved ordering methods, improved reporting formats, and access to laboratory consultation are potential ways to lessen uncertainty about ordering laboratory tests and interpreting the results. Collaborations among primary care physicians, laboratory professionals, and bioinformatics experts could generate electronic tools to address the challenges identified in this survey, thus enhancing the safety, effectiveness, efficiency, and timeliness and decreasing the cost of clinical laboratory testing. Our survey results suggest that many physicians are ready to embrace sophisticated electronic clinical decision support tools. Funding: This study was supported in part from a contract (GS-10F-0261K) funded by the Centers for Disease Control and Prevention/Agency for Toxic Substances and Disease Registry. OMB Control Number 0920–0893. Disclaimer: The findings and conclusions in this publication are those of the author(s) and do not necessarily represent the official position of the Centers for Disease Control and Prevention. Received for publication March 25, 2013. Revision received November 17, 2013.
. Systematic review: impact of health information technology on quality, efficiency, and costs of medical care. Ann Intern Med 2006;14:742–52.
. Algorithm-based decision rules to safely reduce laboratory test ordering. Stud Health Technol Inform 2001;84(Pt 1):523–7.
. Guideline process improves laboratory use and costs. Crit Care Med 1997;25:1262–3.
. Reflex and reflective testing: efficiency and effectiveness of adding on laboratory tests. Ann Clin Biochem 2010;47(Pt 3):223–7.
. Medical informatics: past, present, future. Int J Med Inform 2010;79:599–610. Institute of Medicine. Health IT and patient safety: building safer systems for better care. Washington, DC: National Academies Press; 2012. National Ambulatory Medical Care Survey: 2010 summary tables. Available from: http://www.cdc.gov/nchs/data/ahcd/namcs_summary/2010_namcs_web_tables.pdf. Accessed October 9, 2013.
. Effect of switching to a high-deductible health plan on use of chronic medications. Health Serv Res 2011;46:1382–401.
. The effects of price information on physicians' test-ordering behavior. Ordering of diagnostic tests. Med Care 1982;20:293–301.
. The effect on test ordering of informing physicians of the charges for outpatient diagnostic tests. N Engl J Med 1990;322:1499–504.
. Impact of providing fee data on laboratory test ordering: a controlled clinical trial. JAMA Intern Med 2013;173:903–8.
. Curtailing laboratory test ordering in a managed care setting through redesign of a computerized order form. Am J Manag Care 2009;15:173–6.
. Evaluating the connections between primary care practice and clinical laboratory testing. Arch Pathol Lab Med 2013;137:120–5.
. Overconfidence as a cause of diagnostic error in medicine. Am J Med 2008;121(5 Suppl):S2–23.